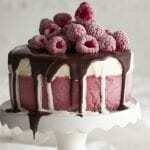 Love Chocolate, Raspberry and ice cream? This decadent treat is yours for the creating. Line a 20cm spring form cake tin with baking paper. Melt 200g chopped chocolate, butter and vanilla together in a heatproof bowl, set over a saucepan of barely simmering water, making sure the surface of the water does not touch the bowl. Remove from the heat and stir in the sugar, then leave to cool for a few minutes. Beat in the eggs, then sift in the flour, cocoa and salt and fold in until the mixture is smooth and glossy. Stir in the remaining chocolate. Pour the mixture into the prepared tin and level the top. Bake in the oven for 25 minutes, or until the top starts to crack but the centre remains gooey. Turn off the oven and leave the brownies inside for a further 5 minutes before removing. Leave to cool completely in the tin. Loosen with a palette knife, clean the tin and place the brownie base back in the cake tin. Spread over the raspberry sorbet and place in the freezer to set. Top with softened vanilla ice cream and freeze until set. Remove from the mould, top with chocolate sauce and decorate with raspberries.